The mango fruit is one of the most popular and nutritious fruits known. In some countries, the mango is popularly termed as “king of all fruits” because of its superior taste, fragrance and nutritional content. Mangoes are tropical fruits and are believed to have originated in an Indian subcontinent. This fruit belongs to the Anacardiaceae family, along with nuts like pistachio and cashew. The scientific name of a mango is Mangifera indica. Mangoes are a rich source of prebiotic fiber, minerals, vitamins and flavonoid antioxidants that fight against free radicals and prevent cell damage. According to research, mangoes have been found to help protect the body from certain cancers (colon cancer, leukemia, prostate and breast cancer). The polyphenolic antioxidants that are present in mangoes are said to be responsible for this function. Mangoes can help maintain healthy vision because of its rich vitamin A content, as well as its beta-cryptoxanthin, alpha and beta-carotene content. These compounds are also known to help maintain healthy skin and mucous membranes. Also, consuming sufficient amounts of carotene-rich foods can help protect the body from lung cancer. The potassium in mangoes helps regulate blood pressure and heart rate. Potassium is also an important part of body, as well as cell, fluids. Even mango peels bring benefits to the body, as these peels contain the phytonutrients polyphenols and carotenoids. In some people, eating unripe and raw mangoes triggers an allergy. Symptoms of this allergy include itchiness of the lips, mouth and the tongue tip. Severe reactions include lip swelling, respiratory problems, diarrhea and vomiting. The chemical compound responsible for this allergic reaction is anacardic acid, which is found in unripe and raw mangoes. 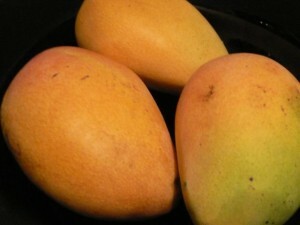 Thus, people who have known allergies with mangoes should avoid eating this fruit in order to avoid an allergy attack.